We focus on developing Savannah cats and savannah kittens who are loving, affectionate and loyal companions – with an exotic look. We aim to breed gorgeous, exotic spotted coats, long legs and traits as close to the Savannah breed standard as possible. Our kittens are a result of savannah to savannah breeding and are well socialized with children and adults, different places and pets before going to their new homes. Please be prepared to tell us a bit about yourself when you contact us, about your lifestyle, family, children, ages and your existing pets. Do you work long hours, spend a lot of time away from home and have enough space available for your savannah to play? These questions may sound too personal and invasive to some, but these are our precious savannah kittens we will entrust you with…they are members of our family and we want to ensure they go to the home most appropriate for them. All of our savannah cats have pet insurance and we highly recommend it – we use Trupanion. A non-refundable holding fee and signed legally binding kitten contract is required. We prefer our savannah kittens to be picked up in person, but shipping can be arranged. We accept cashiers check, personal check (sent a week before pickup), cash and money orders only. Kittens are priced according to generation, quality and adherence to the Savannah Breed Standard. We make NO guarantees, promises or speculations on the future size of any Savannah kitten from Agato Savannahs. We CAN guarantee your kitten will be beautiful, healthy and happy. Please be sure to research this unique, wonderful breed before purchasing to make sure this is the breed for you. There are many resources on the Internet to do so. Savannahcatchat.com is a forum specifically for savannah cat lovers and breeders and is full of information about the savannah breed. 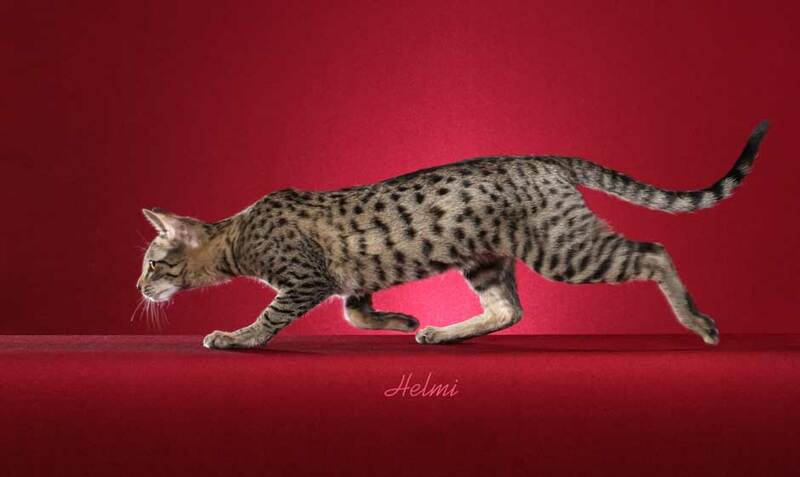 It is the buyer’s responsibility to assure Savannah Cats are legal in their place of residence. Please check here for the legality of purchasing a savannah cat: www.hybridlaw.com Renters must have proof from their landlords that cats are allowed. We reserve the right to refuse to place any of our savannah kittens with any person we feel will not provide the best possible home. We offer life-long support to our kitten’s new families; please call or email if you have any questions! Our savannah kittens are registered with TICA (the International Cat Association). It is important to introduce your new savannah kitten slowly to his/her new home in order for the kitten to have the least amount of stress possible – isolating your new savannah kitten from other pets and daily family activities for one to two weeks is the rule of thumb and what we suggest, as well as keeping your kitten in a smaller room such as a bathroom or bedroom. Food and fresh water bowls should be kept close as should a litter box. We use Dr. Elsey’s Precious Cat Ultra Clumping Litter, Petco litter as well as Equine Fresh Pine Pellets (from Tractor Supply) and suggest you use the same litter initially to prevent unnecessary accidents from occurring. The reason we use Dr. Elsey’s or Petco litter is that it is a fine, sandy type of litter and cats love to dig in the sand. We have NEVER had a kitten or cat refuse to use a litterbox. We do not use these litters with our baby kittens, since babies have a tendency to eat litter – instead we use Yesterday’s News or World’s Best, since it is corn-based. We feed a primarily raw food diet, but also some canned food, so our kittens can adapt to either comfortably. Currently we feed Natural Balance Catatouille Grain free cat food (come in tubs). We also feed Proplan Liver and Chicken for Kittens as well as Proplan Beef and Chicken (adults) – these are the canned foods we use. Our kittens grow up on Darwin’s Natural Pet Food (Chicken and Turkey) and/or Ground Rabbit from Hare Today and Blue Ridge Beef Kitten Mix. Please be sure to feed your kitten the same food as we do for the first month or so to avoid tummy upsets. Please be sure to have a scratching post or two ready for your new kitten, a cat tree and toys that will not fall apart easily to avoid choking. Our kittens are used to water fountains, but they are not a necessity. Savannah cats are very curious and highly intelligent, seeking lots of play time and interaction. Your savannah kitten may follow you from room to room, play with running water, fetch a small ball and just entertain you like no other cat. We keep our kittens until they are 12-16 weeks old for maximum socialization. We have researched this subject at length, talking with fellow breeders and behaviorists…kittens are more adaptable and confident it seems, at 16 weeks. And bonding often takes place quicker and stronger since the kitten is more confident. Be sure to “savannah proof” your home to avoid unnecessary accidents and injury. Please enjoy your new kitten, and do not ever hesitate to contact Agato Savannahs if you have any questions.